I am on 500mg/week of Test E. Split into 2 pins per week. The day I had this bloodwork done, I was due for a pin that day, but hadn't had it yet. I had the bloodwork done at 4pm or so, and did not fast. This is my first cycle. This test was done on the first day of week 6. 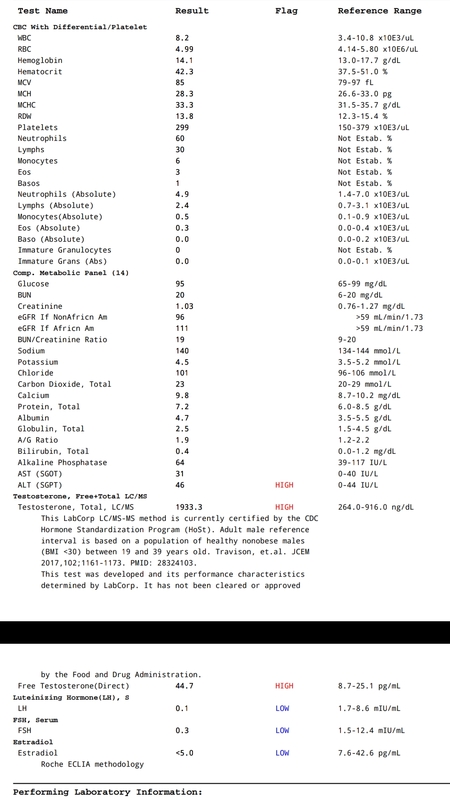 Weeks 1-4 I was taking 25mg dbol , so this test was 2 weeks after stopping dbol. I am curious if the test level is where it should be. Is the gear under dosed? And, in your opinion, if these were your results would you purchase from that supplier in the future? You should never get bloods done in the late afternoon. You should ALWAYS have them done 48-72 hours after your first pin in the MORNING. Once you wake testosterone drops through out the day. Being on 500mg a week of test e with 1900 is low in my opinion , but that might be due to you getting your bloods done late in the day. Also your E is low . Did you get the sensitive test or regular ? Thanks for the info guys. Next time I will be sure to do it in the morning. I thought I requested lips but i guess i messed up when i ordered it. I'm going to get that done separately once i get a chance. I was getting sensitive while on the dbol and was taking aromasin . I was afraid to have gyno sides so I think I've been overusing the aromasin since stopping dbol. Now that I got the bloods done, I am backing off of the aromasin. Last edited by Angrybadger; 09-05-2018 at 11:16 AM. Assuming my unit converter is accurate, you are definitely on the low side. Is your gear from a well known UGL, a local UGL, or Pharma-grade? Did you buy directly from the lab via a rep, from a website, or from a friend? Last edited by Windex; 09-05-2018 at 08:22 PM. If I am reading the forum rules correctly it seems I am allowed to state who the source was, as long as I'm just not providing lists of sources. Is that correct? Agree with Crisp that 1900 is a bit low. Gear's probably a bit under-dosed. When you test though is really irrelevant when on a cycle of exogenous test. If you were natural or on a TRT dose is would be relevant. Standard estradiol tends to read low in men. Basically you've crashed your E2. Take a week off from your AI and then re-initiate it at a lower dose. I have stopped using the AI for a bit like you suggested, and will use a much lower dose when I need it again. I may just look for another source before doing another cycle. You should invest the extra time to find Pharmagrade, it will cost twice as much but you won't have the same fear of underdosed again.